Here's a dinner that came together out of necessity. I had planned on making falafel, but realized that its hour-plus cooking time made it a foolish choice, given that this dinner was scheduled the night before we were to leave for a long weekend vacation. Ugh. In addition to being ideal for mashing avocados, a pastry blender works great with chickpeas too. 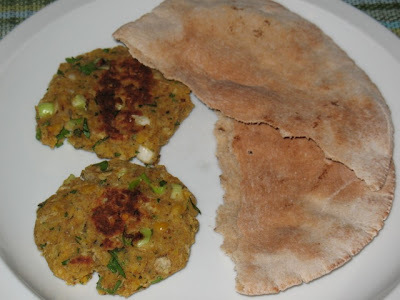 So I improvised, digging into my recipe archive for a dish that I hadn't made in years but that Chris and I used to love: a falafel-like chickpea patty that is pan-fried rather than deep-fried. So in addition to be a quicker recipe, it's also healthier. Homemade hummus is easier than I realized; Smoked paprika makes it a little orange. I also nixed my plan to make tzatziki, repurposing the Greek yogurt into the dressing for the salad (which would have been an herb vinaigrette except that Giant and Whole Foods were both sold out of mint, dill and basil the day I went looking for them. Ugh). So this dinner isn't authentically Mediterranean. Rather Medterranean-ish, I suppose. But it was really good. And I didn't get in trouble, despite making a somewhat complicated meal on the night we had to do laundry, packing, etc. That's a nice benefit to being a cook: good food can frequently get you out of a jam. 1. 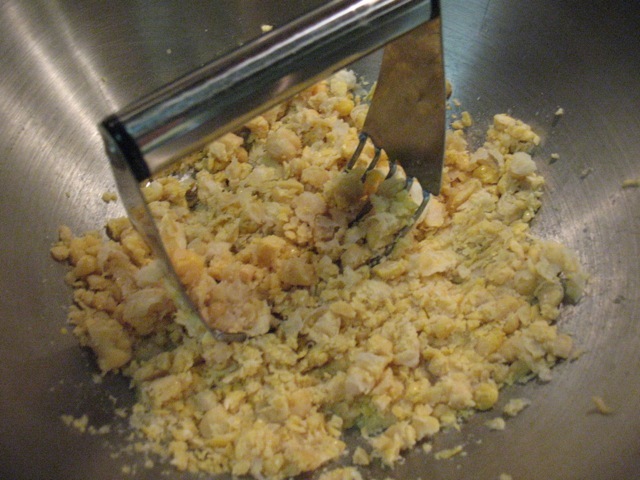 Add chickpeas to large bowl and mash (I use a pastry blender, but you can use a fork or potato masher). 2. Add eggs, bread crumbs, parmigiano-reggiano, parsley, scallions, pepper, seasoned salt and garlic and stir until ingredients are combined. Using your hands, form into 6-8 rounded patties about 3/4-inch thick. 3. Heat a large frying pan over medium heat. 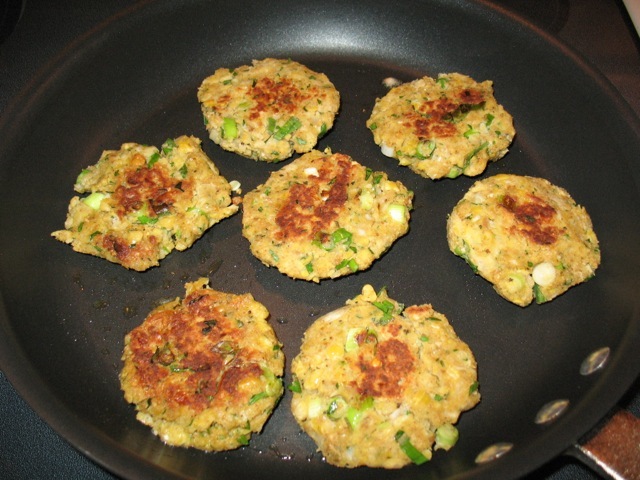 Add olive oil and, when hot, add the patties, spacing them evenly in the pan. Cook until browned, about 5 minutes, turn over and cook another 5 minutes. Remove from pan. Serve with pitas and hummus. 1. 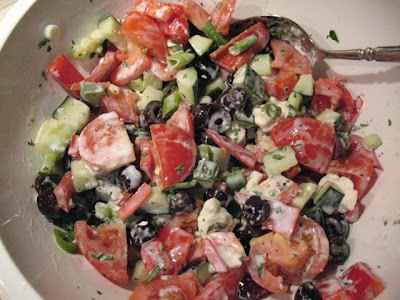 Combine cucumber, tomatoes, scallions, bell pepper, olives and feta cheese in a large bowl. Whisk together yogurt, lemon juice, salt, pepper and parsley. Pour dressing over salad ingredients and toss to combine. 1. 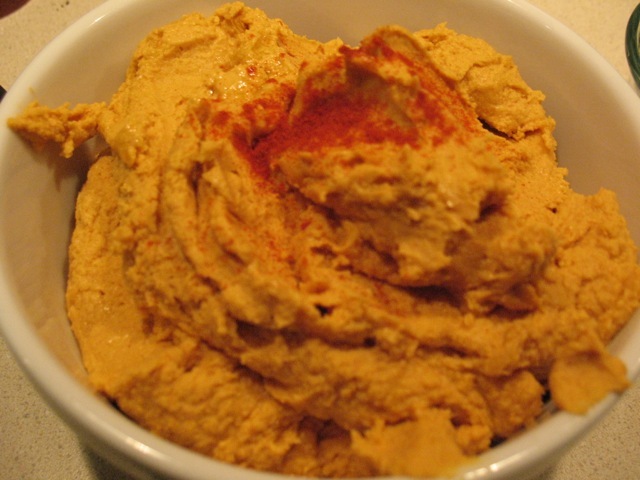 Add chickpeas, tahini, olive oil, garlic and paprika to food processor and turn on. Drizzle lemon juice through the feeding tube, adding more to reach a desired consistency (it should not be runny, but not so thick that it's difficult to eat with pita chips). The hummus recipe makes more than you need for the patties, so here's a way to use it up a day later. 2. Cut pitas into eighths. Distribute evenly on a large baking sheet. Spray cut pitas with olive oil and sprinkle with cumin, paprika, garlic powder and seasoned salt. Bake until crispy, about 15-20 minutes. Ha ha. Are you suggesting moi would have been upset with you for making such an elaborate meal on such a busy night? Surely not! You are correct, though: Good food will always get you out of a jam.